and turn around whenever you've had enough." After the holidays, I find that I need to get out and move. A big hike. A long bike ride. It's not about starting big on the perennial "be more active" resolution. My aim is to simply chip away some of the physical and mental rust that accumulate during the stretch of sedentary indulgence between Thanksgiving and New Year's. Luckily, we live in Southern California, which consistently delivers up some of the finest January weather this side of Maui. Getting outside is easy. While most of the country shivers, we shuffle around in flip-flops. They're salting sidewalks. We're skating on them. They're dreading sleet. We're donning sunscreen. Sure, our nightly lows might dip under 50. But the days bring forth t-shirt weather, burnished blue skies that beckon us outside to slough off the holiday sloth, stretch our legs and clear our minds. So what better place to enjoy Southern California's winter gift than the beach? If the water sounds too chilly, try the trails. 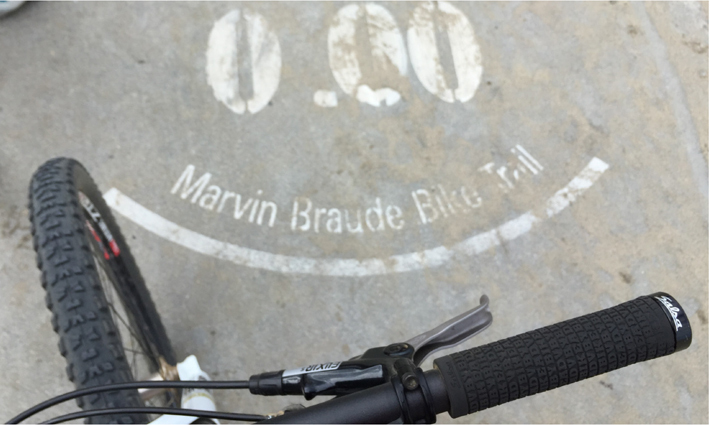 The Marvin Braude Coastal Bike Trail runs 20 miles from Santa Monica to Torrance, offering a rolling panorama of surf and sand. The smooth, flat path lets you put together a ride suited to your ability. Start anywhere along the way and turn around whenever you've had enough. We parked near the Santa Monica Pier and pointed our handlebars south one morning. It was early, so we mostly had the path to ourselves. The world-famous Venice board walk was largely asleep. Its more permanent residents were bedded down in the surrounding dunes underneath blue tarp-covered mounds. The path left the shore to circle around Marina del Rey, returning us to the sand after crossing Ballona Creek. One beach merged into the next as the miles clicked by. Dockweiler. El Segundo. Manhattan. Hermosa. Redondo. By the time we reached the end of the trail at Torrance Beach, it was time to refuel. We headed back the way we came toward Hermosa's Pier Avenue. A valet bike parking area gave us the confidence to leave our bikes long enough to linger over breakfast on American Junkie's welcoming patio. We drained multiple cups of coffee and devoured a Garden Omelet (April) and Junkie Omelet (me) in anticipation of finishing our ride. The real appeal of American Junkie, though, was its front row seat to the passing parade of humanity along pedestrian-friendly Pier Avenue. Dogs, strollers, surfers, cyclists, bikers, hipsters, seniors, families, teens and even dogs in strollers. It seems there was a representative of nearly every subculture imaginable strolling along the promenade. Ready for the rest of the ride north, and the accompanying headwind, we retrieved our bikes and retraced our route. It was later in the day, and there were a lot more people to dodge. Rollerbladers and tourists on rental bikes. Surfboard-toting locals on rusty beach cruisers. Families dragging barbecues and coolers to the fire pits at Dockweiler. Even the air traffic increased, with the shadows of departing jumbo jets sliding across the sand as they lifted off from LAX. Venice was awake now. Skaters cruised the boardwalk. Tourists gawked. Sidewalk vendors displayed their wares. Most of it was a blur. I was tired by this point. Just wanting to be done, I pumped the pedals and hurried back to the parking lot where we started. The final mileage on Strava said 38.7. We finished with a quick dip in waves. The Pacific's chill washed away the sweat, along with any remaining lethargy. Eric Harnish parks his bike in Castaic.